AIM CNC Coilers can be tooled for free coiling of copper, stainless steel, and other types of thin wall tubing. Free coiling requires minimal tooling and is more effective and efficient than conventional tube winding around mandrels. Both coil diameter and pitch between coils can be varied with simple and quick program changes. 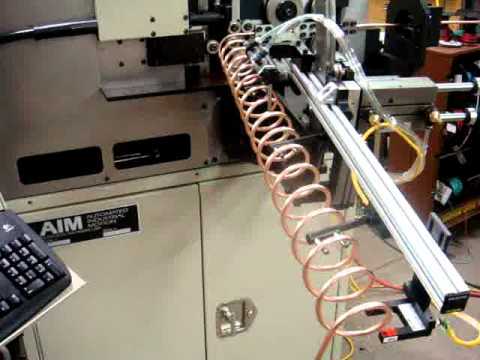 Coils are produced automatically without operator intervention. Contact us today to learn more! Our experts can help you find the best solution for your manufacturing need. © 2019 Automated Industrial Motion. All Rights Reserved. Sitemap. Read the AIM Privacy Statement. Website Designed & Developed by Revel.